Set unique experience with Baloons Over Bali! Ubud is legendary for its brilliant array of nature’s most vibrant shades, especially around us here at Tanah Gajah. Now see this spectacular display from above, with the Island of the Gods’ first and only ballooning opportunity. 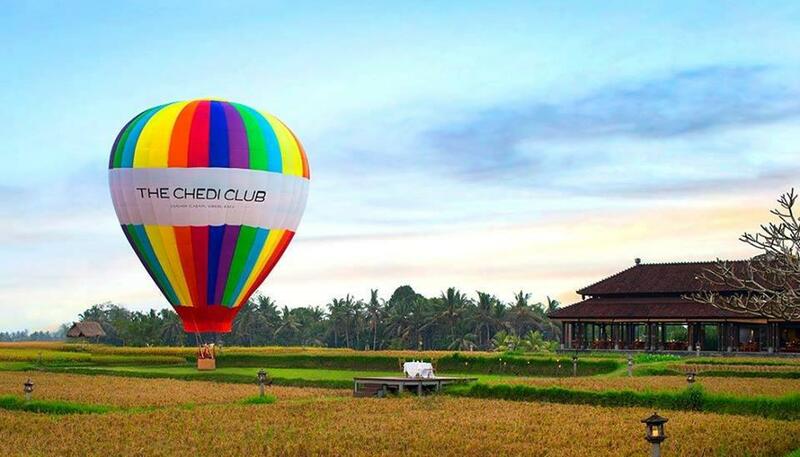 The Chedi Club Tanah Gajah’s new, one-of-a-kind adventure goes up in the air by 23-metre hot air balloon, fitted for our guests with a cosy wicker basket. Throughout the months of June to November, each flight climbs a thrilling 50 metres over rice fields and floats at the end of a tether. Truly awe-inspiring panoramas extend from the lush tropical forests of Ubud to holy Mount Agung on the eastern horizon. To enhance this mesmerising experience, our morning passengers will enjoy breakfast before or after their balloon adventure, while tea and treats is included in the afternoon flights and dinner for our evening adventurers. This adventure is open for in-house as well as outside guests. Get one The Chedi Club Tanah Gajah elephant as a souvenir and hot air balloon certificate for every reservation. Be sure to not miss this new and special experience in Bali! Book your hot air balloon ride at www.maimilu.com/e/balloons-over-bali now!